In a Nutshell: Between the planning, the packing, and the planes, traveling can be a pain. Thankfully, the right travel credit card can make traveling a little easier — and more affordable — with great rewards and stress-saving travel perks. 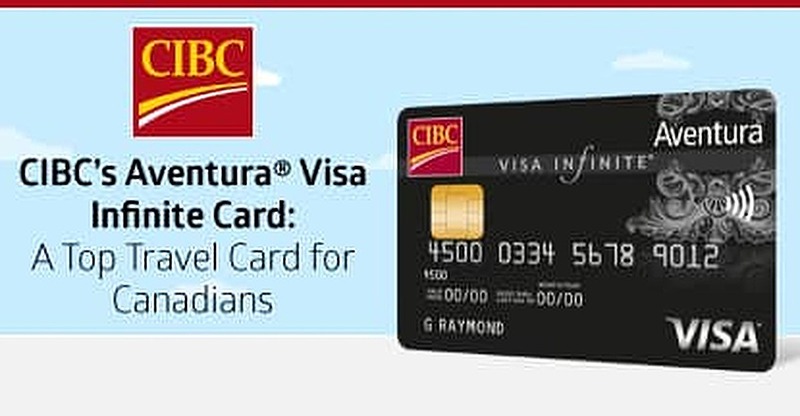 In fact, one of the best travel cards in Canada, CIBC’s Aventura® Visa Infinite Card can help you save right away with flights as low as 10,000 points and a significant 15,000-point welcome bonus. Your Aventura card can also help ease the stress through the CIBC Travel Concierge program, a personalized concierge service offering one-on-one relationships with knowledgeable concierges who help with planning, booking, and even last-minute questions while you’re on the road. With only two weeks of guaranteed paid time off, Canada falls low on the list of industrialized nations — though still quite better off than the US, which has no such guarantees. However, regardless of — or, perhaps, because of — their limited time off, most Canadians don’t skimp when it comes to traveling. In fact, Canadians rank sixth for international travel, averaging one trip abroad per person every year — five times the travel of your average American — and eighth for travel overall with just over three domestic trips per person. With so many Canadians enjoying the pleasures of travel, it makes perfect sense that a growing number of credit card issuers are looking to capture their interest (and purchases) through travel rewards. Across the field of credit card options now available to travel-savvy Canadian consumers, however, some certainly stand out from the rest. Recognized among them is the popular Aventura® Visa Infinite credit card from CIBC, which has been much lauded for its any-flight-any-seat travel rewards program since its reinvention in 2013. In addition to being free of airline or blackout date restrictions, the Aventura program has been a big hit for its wide variety of travel perks. This includes a range of included insurance options, such as trip cancellation and travel medical insurance, which help offset the card’s market-competitive $120 annual fee. 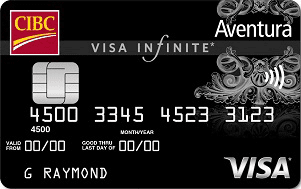 In addition to the great insurance benefits, at the heart of the Aventura card is the flexible rewards program. Cardholders can redeem points for a variety of uses, including the popular travel options that are free from airline and blackout restrictions. “With the Aventura program, you can fly any airline, get any seat — you’re not tied to one airline,” said Mark. “You can absolutely use your points for anything you desire, within Canada, outside Canada, and around the world.” CIBC also works closely with the airlines to provide a range of great deals on popular flights to ensure value for its rewards members. As remarkable as the travel rewards are, Aventura members are hardly limited to using their points for travel. The program also offers clients a large number of other redemption options, including paying their credit card balance and mortgages, buying gift cards and merchandise, or placing a bid on the kind of experience that makes memories. And unlike some other programs, new Aventura members won’t have to wait months or years to earn enough points to enjoy some rewards. Each new Aventura cardholder receives a 15,000-point welcome bonus after making their first Aventura card purchase (and no minimum purchase amount). To make it even more valuable, until the end of 2017 new CIBC cardholders can also qualify to have the first year’s fee waived, making it free to start using your new Aventura card — and earn points. New Aventura cardholders are eligible to receive a 15,000-point welcome bonus, which can be redeemed right away for flights starting at 10,000 points. Of course, no matter how great the rewards or bonuses, they do cardholders little good if the redemption process is too much trouble. CIBC and the Aventura team take the customer experience seriously and work hard to ensure each member has a great redemption experience. This includes the newly introduced client feedback tool, which allows each cardholder to fill out a process survey after they redeem points, whether online or through the rewards center. If the survey responses fall below a set threshold, the team is alerted and forwarded the survey results and consumer comments within 24 to 48 hours so action can be taken to correct any problems. And CIBC offers Aventura clients a personalized Travel Concierge when booking by phone, offering personalized service not often found with many run-of-the-mill concierge platforms. The average Canadian is only guaranteed two weeks of paid time off — so you better make the most of it. For many, the best way to have an unforgettable vacation is to travel to a new and exciting locale (or even a familiar and relaxing one). No matter where you travel, a solid travel rewards credit card can make it easier, more convenient — and a bit more affordable. One of the best travel cards in Canada, the CIBC Aventura® Visa Infinite Card can not only get you flying right away to tons of popular locations, but offers vast redemption options and a personalized member experience.